We relocated our head office on July 3, 2017, from the Shibaman Building, where we operated for 40 years, in Asagaya in Suginami Ward, to the Fujisawa Building in Ogikubo, located in the same ward. Aiming to create a workplace with an open atmosphere and equal treatment in a one floor office, we will strive to enhance interaction with clients, and further improve communication with head office and store staff. We ask for your guidance and encouragement in the years to come. 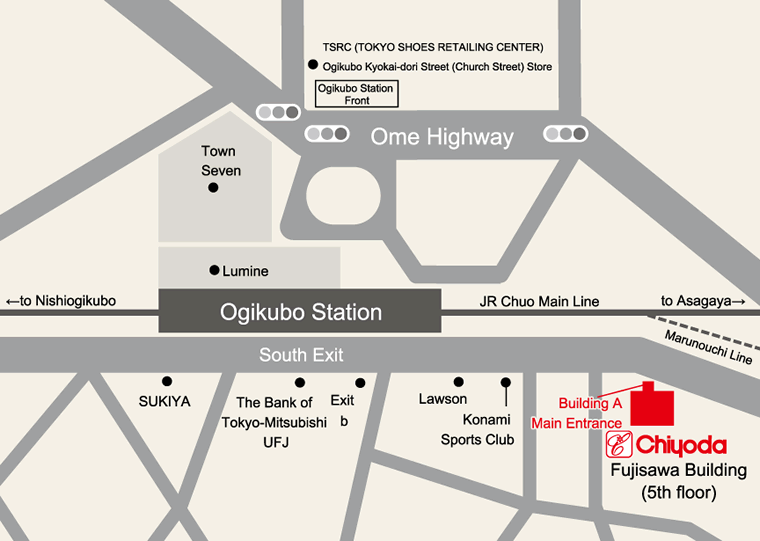 * A 4 minute walk from JR Ogikubo Station South Exit "b". Walk alongside the railroad tracks in the direction of Asagaya; the building also contains the headquarters for American Express International, Inc. on the second floor. * When visiting our office, please go to the joint reception desk at the main entrance of Building A. A staff member will come down to meet you. * Unfortunately we cannot provide parking for visitors. Please use coin-operated parking spaces nearby if you come by car.